Kara and Taff escape into the dreaded Thickety where all things nightmarish reside. Sure enough, they encounter deadly plants, weird rock formations that make deadly copies of objects, vicious animals and the infamous Mary Kettle who murdered countless children. Has Mary reformed or is she still the heartless witch with evil intent in league with the uber evil Sordyr? As in all good stories, things are not always what they seem, or are they? In such a dark, foreboding book, evil has a tendency to twist most everything. 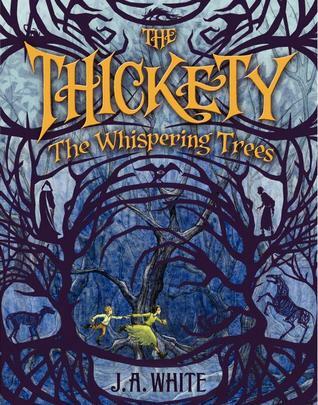 The Whispering Trees follows the classic plot lines of typical fantasy books where the characters learn about their powers as they journey along. But that’s okay! The story moved swiftly along and didn’t bog down at all with the description of the deliciously evil Thickety world that the author weaves. Kara is a young heroine who has been through a great deal and has more evil to clean up in the next book. Taff is an engaging character, still quite young, but might have a greater role in the next book. I hope so.